Efficient real time data collection and workflow tracking for custom manufactures, labs, R&D and engineering companies. When a company produces and tests a product - whether this is a custom manufacturing, lab, research and development, engineering or science & technology company - it needs to keep track of the entire process in the productive and efficient manner. QR Inventory will allow you to track workflow from start to finish: lot numbers of components, serial numbers of instruments, containers and tools used in production, putting together batches and assemblies. You will be able to track project steps that were completed, when and by what employee. You will be able to collect necessary data on every step of the process, fill out mobile forms and checklists. All of tracking and recording is done in real time, on the shop floor or in the lab, using mobile devices (smartphones or tablets) for QR code / barcode scanning and data collection. Finally, you will replace physical paperwork with digital records accessible on demand from anywhere. Create custom workflow(s) for your production process(es) via the web dashboard, and track products through the process in real time with mobile devices (smartphones or tablets). Use mobile devices for QR code / barcode scanning, data entry and look up. Create custom workflows / processes via the web interface. Define workflow steps, provide description / instructions for each step to guide your employees through the process. Optionally select mobile form(s) that need to be filled out on each step. Make forms required or optional. Use mobile devices for QR code / barcode scanning, reviewing and updating information, collecting data and filling out mobile forms. Collected data are saved in a centralized cloud location, so all employees involved in the project have live access to the project's progress and information. Track inventory that you are using for the projects, access up to the minute inventory stock on the smartphone or via the web dashboard. Track materials and components used for the project by lot number or serial number, achieve complete traceability. Track parts and materials used for testing or creating a final product in real time using barcode scanning. Use smartphone / tablet camera for barcode scanning, and save money on purchasing barcode scanning hardware. 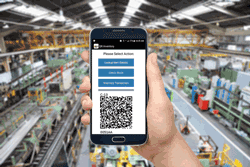 If you prefer to use hand-held barcode scanners for speed, use barcode scanners attached to the mobile devices and natively integrated into QR Inventory mobile application. Track parts and materials by SKU, Lot Number or Serial Number. Trace all product components back to their origin, achieve complete traceability. Drill down assemblies / product batches through intermediate products to the original ingredients / raw materials to get a complete list of what was used in each assembly, with lot / serial numbers and information about each lot production. Look up inventory stock and locations, parts and materials specifications instantly on a smartphone by scanning QR code / barcode. Track the process of putting assemblies or product batches together, step by step. Access live project's progress, what is installed / added and lot numbers / serial numbers of materials. Specify components list for product batches or assemblies, or build ad hoc assemblies without the list. Build multi-level assemblies (assemblies can include sub-assemblies, that in turn can include lower level sub-assemblies, etc.). Drill down to review details of all used parts and components, up to the original ingredients / raw materials. Track building of assemblies in real time by scanning components with a smartphone. When assemblies are built, components are automatically subtracted from the inventory, and assemblies are added. Once created, assemblies can be tracked like any other inventory item - you can track assemblies quantity and transactions using a smartphone. Build generic or serialized assemblies. Keep track of serial numbers / batch number of the materials used in each serialized assembly. Build serialized assemblies against the list by scanning the actual components batch number / serial number. Record all information on the process on site using smartphones / tablets and mobile forms. Create custom mobile forms / checklists via the web dashboard, and your employees will be able to fill them out on the smartphones / tablets during the production process. Create custom mobile forms via the web interface: checklists, inspection forms, quality control forms, data recording forms - any kind of forms that you need to track and document your business procedures. If / when you change workflow or a process, update forms as needed. You can link mobile forms to the specific workflow step, or fill them out independently of a workflow. Your employees can download and fill out mobile forms / checklists on their mobile devices (smartphones, tablets) on site as each project step is completed. Include clarifications and / or images in the forms to make sure your employees know what to do. Optionally administrators can pre-fill part of the form and push it to the mobile device(s) for completion. Collected data are sent to a secure centralized cloud location and are immediately available to all authorized users / devices. Administrators can review submitted forms via a web dashboard. They can further add information or edit the form data if needed. Optionally collect electronic signatures on a smartphone. Create pdf documents with the signature included based on your template. View, print, e-mail psf from the smartphone or using a web dashboard. Give everyone involved in the project access to the live project's progress and information. QR Inventory makes it easy to collect and update information as the changes happen, in the lab, on the shop floor or in the field. All you need is a smartphone, which most employees always have in their pockets. There are no delays in information update, and everyone involved have live access to the project's status and collected data. QR Inventory provides two-way real time information flow. All collected information and updates, whether is is done on the mobile device or via the web dashboard, are saved in the centralized cloud location. Submitted information / updates are available for review to all authorized users, on the mobile devices in the field and on the computers in the office. Eliminate physical paperwork. Replace it with digital records accessible on demand from anywhere and easily searchable. Find the exact information you need fast. All production process data are stored in a secure centralized cloud location. You can access collected records on demand from anywhere. Search records using multiple filters (dates, process, product batch or assembly ID, forms, fields in the forms, etc.) to find the exact information you need. Generate PDF documents for all forms that you are filling out, on a smartphone and / or via a web dashboard. View, print and / or e-mail pdf reports from a smartphone, or via the web interface. You are in a complete control of the PDF reports looks and layout. Control PDF reports layout and data that should appear there using custom templates. Upload and change templates as needed. QR Inventory helps a manufacturing company to efficiently run every day operations and keep accurate records of the manufacturing process. How Ionex Research Corporation, a manufacturer of high-performance process filtration and treatment equipment, increased operations efficiency, improved communication between departments and solved physical paperwork and record-keeping problems with QR Inventory / QR Mobile Data software.